ISBN 0769284868. 9x12 inches. Key: Db major. English. 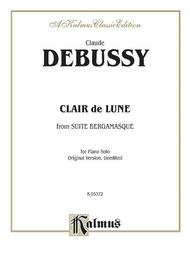 The original, unedited, unsimplified version of one of Debussy's most popular piano works. This ethereal, flowing section of "Suite Bergamasque" is diatonic and displays a conventional harmonic vocabulary in D-flat major. 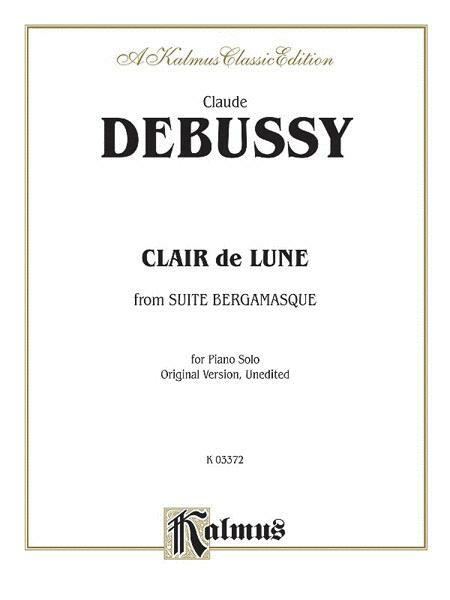 The title, "Clair de lune", suggests a relationship to Paul Verlaine's eponymous poem, describing a vision of long-dead dancers in the moonlight. The music transmits the otherworldly, transparent, and impalpable qualities of the experience while maintaining clarity and definition. Perfect for the burgeoning late intermediate pianist. than the "easier" versions. All the flats initially look very daunting, but once you realize that playing on all the black keys helps your fingers flow with the notes, you'll never go back to another version. of the greatest pieces ever written. I agree with those who say it is totally worth learning and the rewards are great. This particular edition is, well, the print is a little fuzzy. (Maybe it is just my copy) On bright white paper. I think I will look for another edition. 51 of 116 people found this review helpful. 72 of 143 people found this review helpful.